Why Should Everyone Have Shungite Items Around In Modern Digital World? What is an integral part of the modern-day world? What are the things you cannot live without? Undoubtedly, advanced technologies and gadgets will be at the top of the list of bare necessities for the vast majority of people. We use different electronic devices, ranging from smart phones and laptops to more sophisticated machines applied in industry or medical science. They simplify our life and make it more comfortable. But what are the hidden costs of it? The most serious one is electromagnetic radiation emitted by gadgets at a large scale in the form of waves. These waves interact with each other and create electromagnetic fields (EMFs). Although an impact EMFs have on humans is not immediate and obvious, nowadays everyone is exposed to it. It has been proven during numerous testing including research under the auspices of the World Health Organization (WHO). People are exposed to electromagnetic radiation on a daily basis both at home and at work even if they are not dealing with some heavy machinery. Such simple office equipments as computers, scanners, Wi-Fi routers and so on, emit electromagnetic waves. At home, artificial sources of EMFs include TVs, microwaves and different other cordless devices. To put it shortly, our every-day environment is a countless number of electromagnetic fields. How do EMFs affect our health? Constant presence of electromagnetic radiation in our life causes great public concerns over possible health effects. Is it a hazard to our health? This question has been a subject of numerous multidisciplinary studies for a long period of time. In 2010s, a group of independent scientists from 10 different countries elaborated a report, known as the BioInitiative Report. The main aim of the report and the work of these researchers in general, was to find out a correlation between electromagnetic fields and people’s health. According to the Report, EMFs are likely to be a reason for headaches, eye problems, sleeping disorders, lower memory, lack of energy and attention. Besides, it has detrimental effect on reproduction ability and increases cancer risks. The main problem with electromagnetic radiation is that its effect is not immediate and not obvious. It may take a lot of time before serious illnesses develop. 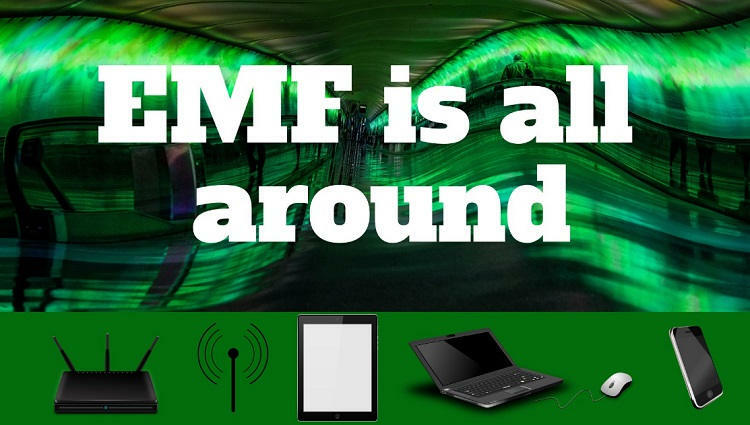 Moreover, EMFs affect different people in different ways. It may depend on the overall condition of your immune system or on how often you deal with EMF sources. Electromagnetic radiation is considered to be more hazardous for children, whose immune system is still developing, pregnant women and people suffering from electromagnetic hypersensitivity. These vulnerable people can face serious health problems even if there is a slight amount of EMF exposure. Undoubtedly, there are still some gaps in knowledge about EMF effects on our health, fierce debates are ongoing and there is a need for more research. But it is always better to prevent some health problems than to deal with its possible long-run consequences. Therefore, if you want to preserve good health you should think about EMF protection. The simplest way to reduce EMF influence is to keep distance from its sources. However, it is obvious that in modern-day world it is impossible. Therefore, people created different EMF shielding devices. For example, different protection cases for cell phones or laptop shields. But all these devices are quite expensive and their functions are limited due to their artificial origin. Plus they have limited life span. 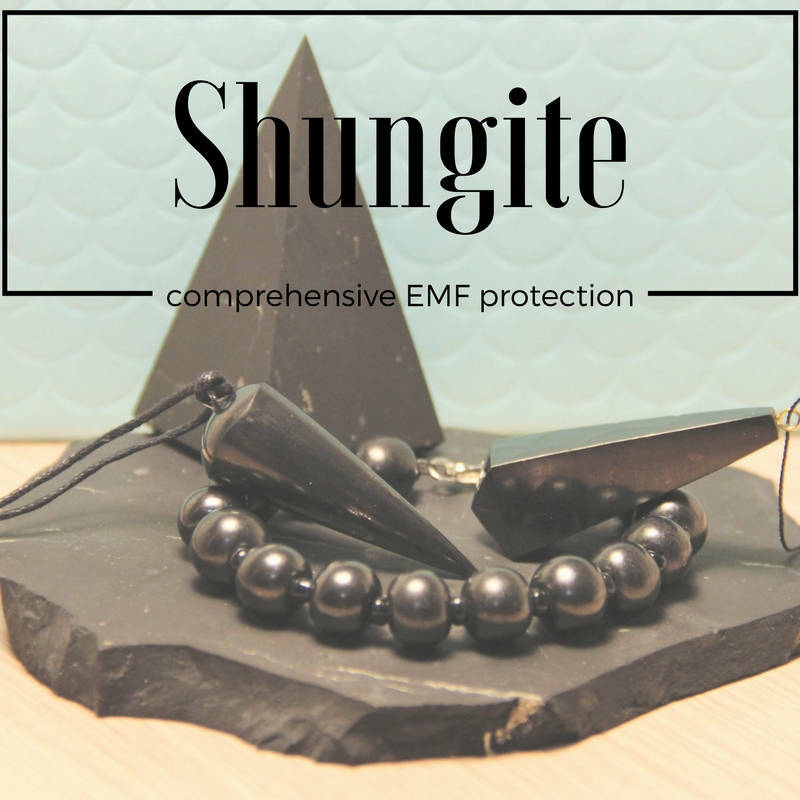 The more efficient and cheaper way of EMF protection is shungite known for its radiation blocking properties. Shungite stones absorb from 90% to 98% of electromagnetic radiation. While blocking EMF it keeps signal intact. There are a lot of experiments proving this fact. Furthermore, life span of shungite stones is unlimited. They can be used over and over again if you regularly clean and recharge the crystals. What should we do to use shungite as EMF shield? There are several options. First of all, we can use shungite pyramids or spheres for overall EMF protection. For example, if you place a shungite pyramid at your desk at work, you will bring electromagnetic radiation emitted by PC, laptop or Wi-Fi router close to zero. Apparently, the more shungite items you have in your office, the more protected you are. Moreover, the radius of action depends on the size of items. The bigger pyramids or spheres are, the better. It is the same deal with your home. You can set shungite pyramids, spheres or eggs in a living room, in a kitchen and even in a bathroom. Besides, they can serve as stylish decorative elements in your house. If we speak about cell phones, as the most frequently used source of electromagnetic radiation, shungite is also a way out. It is widely recognized that EMFs created by phones are even more dangerous because of the high intensity of transmitted electromagnetic waves and their proximity to the head. Studies have shown that when you hold your cell phone up to your ear, up to 80% of radiation penetrates into your brain. In addition, it is necessary to remember that mobile phones emit EMFs even in a standby mode. That’s why constant use of it may lead to changes in brain electrical activity, brain tumors and other severe diseases. To reduce this harmful influence you just need to attach a small shungite plate to your phone. You can tape it also to your tablet or mp3-player. Another trendy solution to this serious problem is shungite jewelry, which will ensure everyday personal EMF protection. 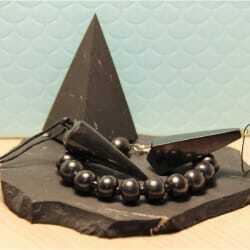 Shungite bracelets, necklaces and earrings are not only eye-catchy accessories, but also extremely efficient EMF shields. Moreover, it is necessary to take into account their close location to sensitive parts of our body and bioactive spots. For example, wrist area is deeply connected with cardiovascular and nervous systems. 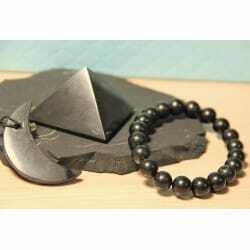 And shungite bracelets are considered to be especially useful for those who use computer mouse. Necklaces are close to heart, earrings are close to brain. Therefore, they encourage normal functioning of all body systems. Shungite stones shield us from the negative influence and accumulate the positive one by transforming the radiation into biocompatible elements. It helps to relieve stress, increase learning capacity and overall productivity. Thus, wearing shungite jewelry you not only keep up with the fashion, but also protect yourself against EMFs and improve psycho-emotional balance. Apart from man-made EMFs protection, shungite is widely applied for neutralizing geopathic stress zones resulted from natural electromagnetic fields of the Earth. Living in areas affected by geopathic stress may also lead to immune system weakening, restlessness and other symptoms similar to the ones caused by artificial radiation. To ensure comprehensive protection against radiation and other negative influence we recommend using several shungite items. Our experts have even designed special protection sets for this purpose. You can check them, as well as other shungite items, at our product listings. What is more, for efficient protection it is necessary to ensure the authenticity of shungite stones. All our products are certified and will satisfy your demands. We hope, they will let you enjoy ever-advancing technologies without damaging your health. This stuff really works,the effect is almost immediate. Would highly recommend. Creates a clear spot, a solid vibration. The craftsmanship in the pieces is excellent and Karelian heritage were very courteous and helpful. Will use again.